Suffice it to say residential construction costs have many variables and as a result it is difficult to provide a simple answer on the cost per square foot of building a home or home addition. However, it is the per square foot cost that is probably the best metric for quickly evaluating a house construction contractor bid, at least in terms of pricing. There are many factors that must be considered in order to calculate cost per square foot on a home construction project. In addition, the per square foot cost is sometimes shown in two different ways, one with the cost of the building lot included and one without. How Much to Build a House on my Land? For the best apple-to-apple comparisons of per square foot costs of new home construction it is best to calculate home construction costs without the cost of the land factored in. Thus, if you already own your land simply neglect it in your cost analysis. And if you don’t own the land, still neglect it in your cost analysis when determining the per square foot cost to build a house. The actual per square foot cost formula simply involves dividing the total cost of the home construction project by the total square feet of the project. For example, if a 400 square foot home addition costs $50,000 to build, the per square foot cost for the home addition would be $125. If on the other hand the same square foot home addition costs $75,000 to construct, because for example the inclusion of high end materials or a bathroom, the cost per square foot would be $187.50. After calculating the cost per square foot of your house, you should compare it with the average cost to build a house in your local housing market. You can find average cost to build a house in your local real estate market by talking with a local real estate professional. After calculating the cost per square foot of your house, you should compare it with the average cost to build a house in your local housing market. You can find average cost to build a house in your local real estate market buy talking with a local real estate professional. How Much to Build a House or Home Addition? 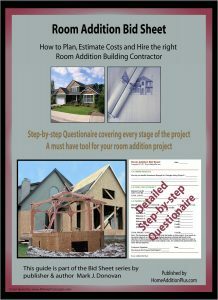 Use my cost per square foot calculator associated with each of my home addition bid sheets to calculate the cost of building your new house or home addition project. The calculator uses an average price per square foot for each construction phase of building a house or home addition. Each home addition or house construction bid sheet includes a Microsoft Excel worksheet that I have personally developed that allows you to calculate the cost per square foot to build a house or home addition. The amount of square feet to use in the per square foot cost calculation can also be a variable. Heated living space is normally considered the rule of thumb, however local tax assessors may also define certain non-heated living space as finished living area. The type of home construction also plays a major role in the per square foot costs. For example, a two story home is cheaper to build than a single story home with the same square footage. The reason for this is that with a large single story ranch, for example, twice as much roof is required as a 2 story home with the same square footage. Also, if the roof pitch is increased, the amount of lumber and roof sheathing required goes up, which as a results raises the cost per square foot home construction costs. Similarly a basement remodeling project is typically much cheaper on a per square foot cost basis than building an attached addition, as a basement remodeling project does not involve including a new roof or exterior walls. Other structural factors that impact the per square foot cost to build a house include the home style, the number of jogs in the foundation, the number of roof lines, the local required footing depth, and whether the home is built on a slab or includes a basement. All of these factors, and more, need to be included in the building cost calculator estimate tool in order to achieve an accurate cost per square foot to build a house. Construction material types and certain home features in the home plans also contribute significantly to the cost per square foot of home construction. For example door and window prices can vary widely depending upon the type specified in the home construction plans. In addition, if the home plans include archways and curved stair cases, per square foot construction costs can rise very quickly. Also, vaulted ceilings can add dramatically to the cost per square foot in new home construction. If a vaulted ceiling takes the place of potential additional second story living area, while the total construction costs remain nearly the same, the reduced square footage of finished living area plays a major factor in the cost per square foot calculation. As with any industry it’s all about supply and demand economics when it comes to home construction. If there is a tight construction labor market, expect to see higher priced home construction bids. Also, the time of year plays a role in home construction costs. Home building is best accomplished during the warmer months of the year and consequently there is high demand for labor and materials during these times. During winter months, there is usually less demand for home construction, consequently material and labor costs can be cheaper. This said, it can also be more difficult to find construction labor willing to work this time of year and breaking ground and pouring foundations during winter months can be a challenge. Overall state, regional and national economic factors also play a role in per square foot home construction costs. An overall down economy and/or housing market reduces home construction labor and material demands, which as a result translates into lower market value for homes and lower new home construction costs. Each town, city, and state assesses various impact fees for new home construction. Fees are typically tied to the building permit process. Impact fee costs can range from a few hundred dollars to tens of thousands of dollars depending upon where you live and the impact the home construction has on the local area. In addition, the town, state or home association may have specific covenants or restrictions on what type or size of a home or home addition can be constructed. Setbacks and other various zoning laws may also impact the per square foot cost for home construction. In some cases variances may need to be applied for which adds to the total cost of the home construction project. Also, the town or state may have temporary moratoriums on new home construction due inadequate municipal services such as schools, police and fire services. Liability insurances, utility connections, on-site portable toilets and dumpsters, septic systems, wells, landscaping, driveways, decks and porches are other items that add to the bottom line when calculating per square foot costs for new home construction. So as I stated earlier calculating per square foot costs for home construction includes assessing numerous items, many of which are variable to location, season, economic conditions and governments. This said, expect to pay somewhere between $90 and $200 per square foot costs for new home construction, depending upon the various factors mentioned. To accurately calculate the cost per square foot to build a house ultimately you, or your home construction contractor, will need to price out every item in the new home construction project, both from a materials and labor installation standpoint. To properly do this, you will need a complete set of home construction plans and a home construction checklist. 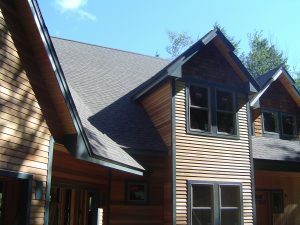 The home construction plans should include blueprints and a complete cost breakdown of materials so that a contractor can bid the job accurately. The home construction checklist should include a detailed plan for defining the home construction project, hiring a contractor(s), obtaining permits, material selection, managing the actual construction, and calling for inspections. See my Home Addition Bid Sheets to learn more about home construction checklists. To get ballpark figures on expected costs per square foot also check with local banks and real estate agents. They can usually give you rough cost per square foot construction costs for your local area. 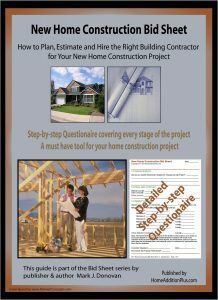 This way you have a reference point for assessing home construction contractor bids for your home construction project.